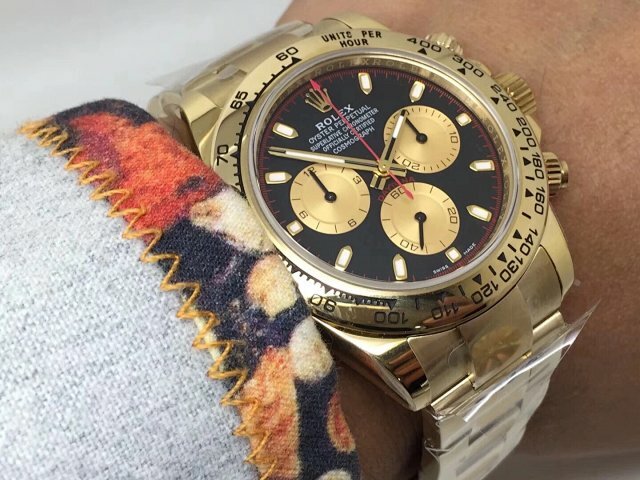 Daytona and Submariner are two models that have been mostly replicated in recent months. Both Noob and AR factories have brought us a lot of amazing replicas during this period, I can not share all of them with you here, so I chose some representative models to review. 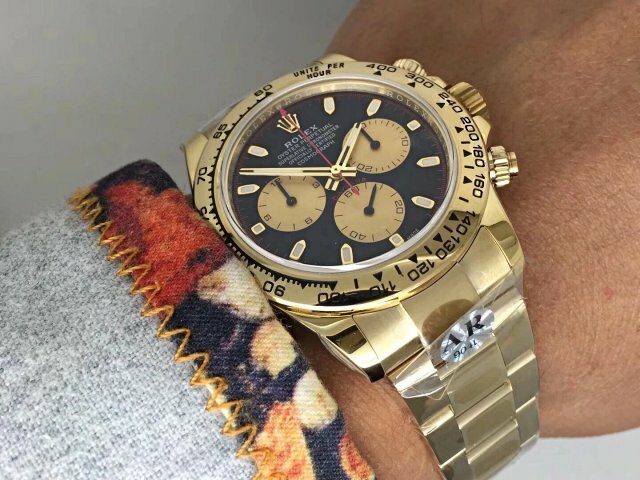 Today, I will introduce another novelty AR factory has brought to us, it is a Daytona replica watch, which is in full yellow gold. This is the latest V2 edition, AR updated its bezel, dial and bracelet on basis of V1. 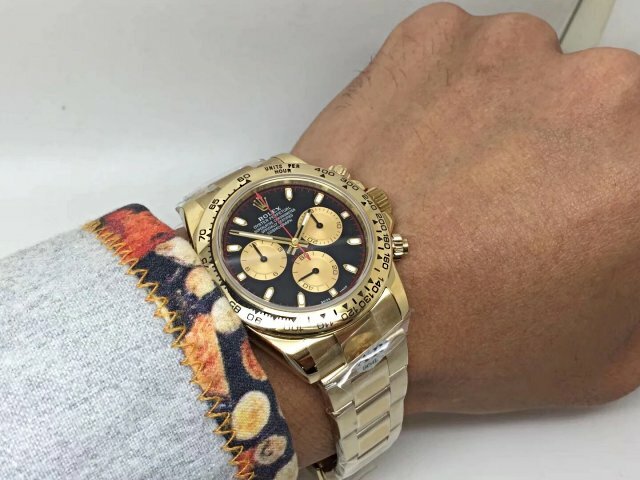 There are several selling points on this replica watch, please read the following article. 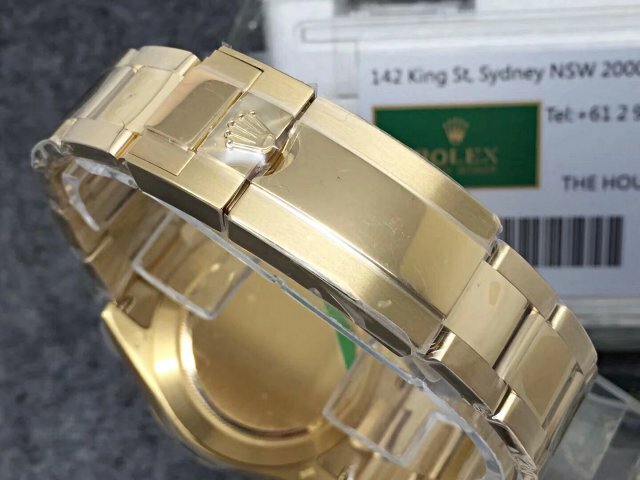 First, the watch is fully made of 904L stainless steel, while on the surface of case and bracelet, there is a thick layer of 18K yellow gold, which is measured to be 5 mils thick. This is one of the selling points of the replica. Based on V1, this time AR factory made improvement on the case engraving and bezel engraved numerals. 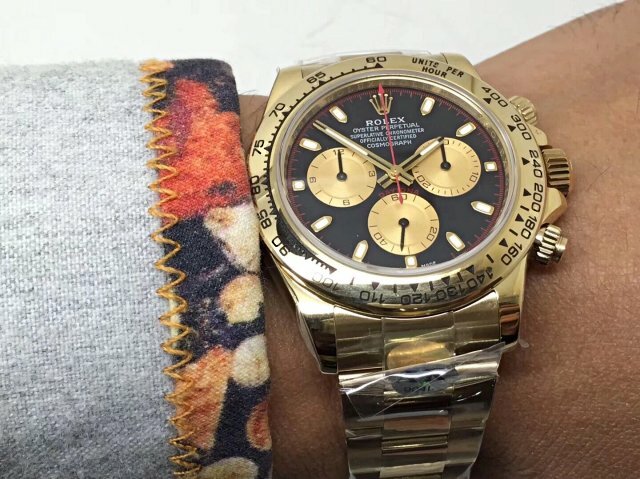 The black color of the tachymeter scales on the bezel is closer to genuine. 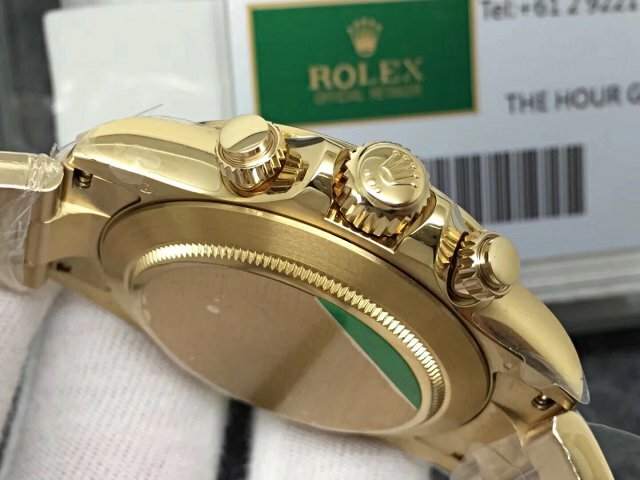 About engraving, check the back side of each lug, it has correct symbol engraving like genuine watch case. The second selling point, it is the movement. 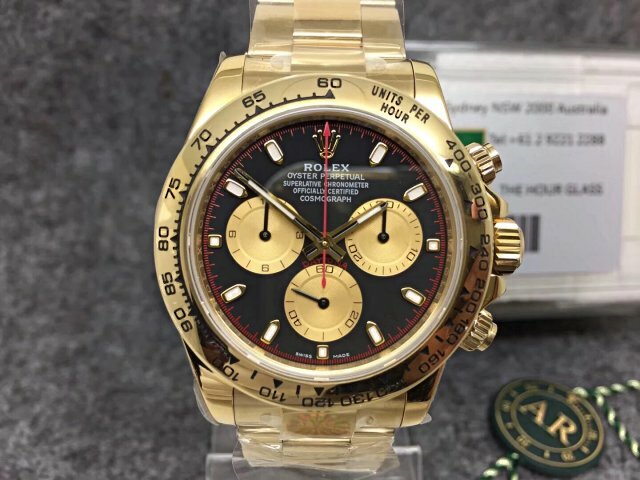 Actually I did not recommend AR Factory Daytona before, because they do not have a full chronograph function, the subdials at 3 o’clock and 9 o’clock have no function, only the second-chronograph hand on the center is working. 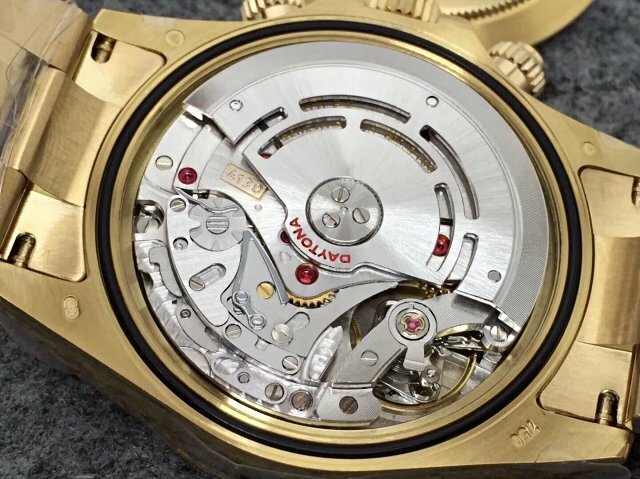 However, when I think back, although the replica does not have a full chronograph function, its movement may be more reliable. 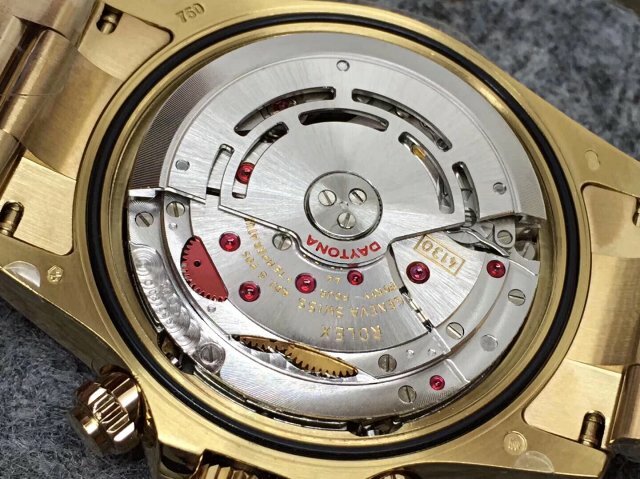 Some features are sacrificed, this makes the movement to be slimmer and more stable. 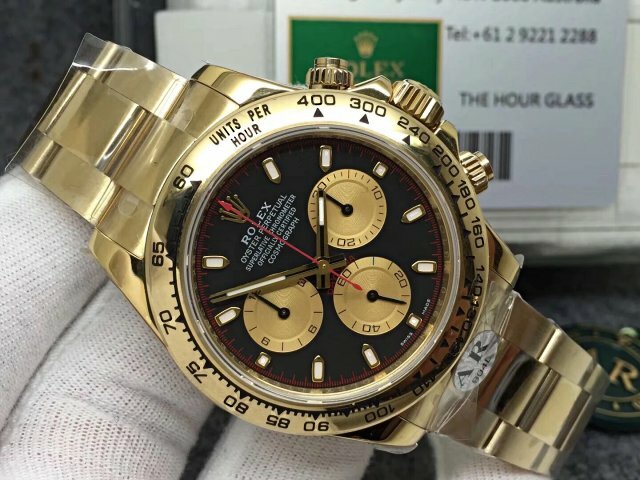 We know Noob also makes this Daytona with full chronograph function, all subdials are working like genuine, but I do not think the movement of Noob Daytona is more reliable than that of ARF Daytona. 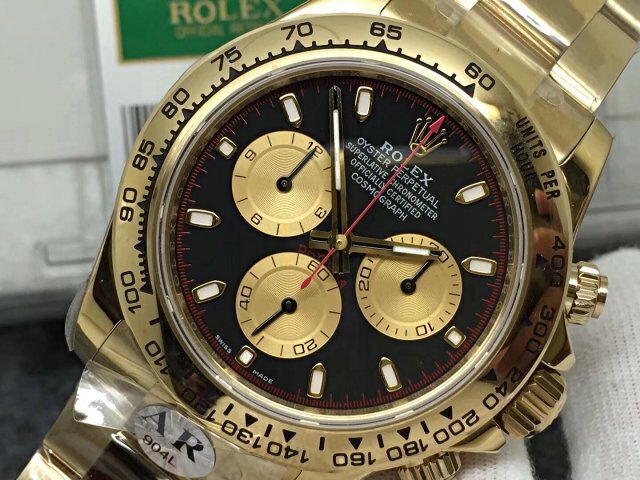 Besides, the ARF Daytona is sold at a much cheaper price. The black dial looks amazing, the red color usage highlights the whole dial, especially the red big second hand and red minute scales. 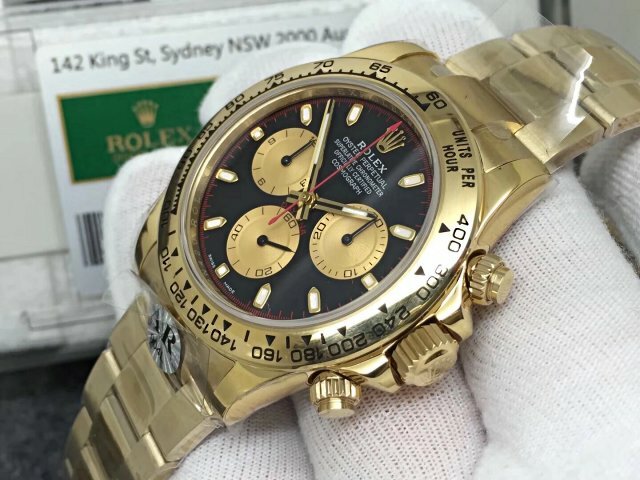 Three small dials are in golden tone with black hand. The design of subdials is delicate, multi-layer three-dimensional visual effect is obvious. 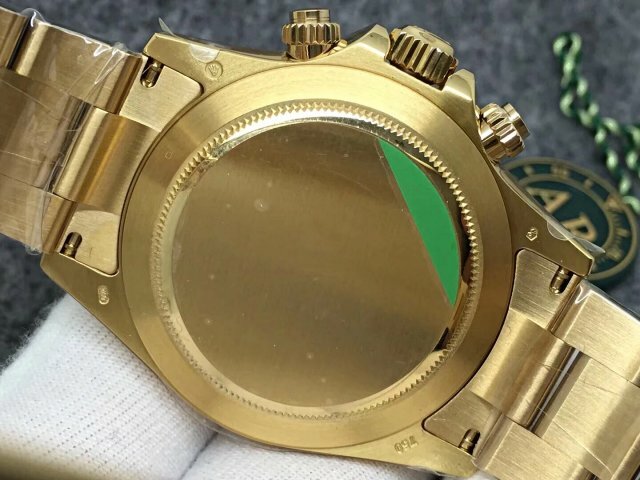 Hour markers, hour hand and minute hand have increased amount of Swiss lume material, so they will offer the wearer a long-lasting lume light in weak light conditions. 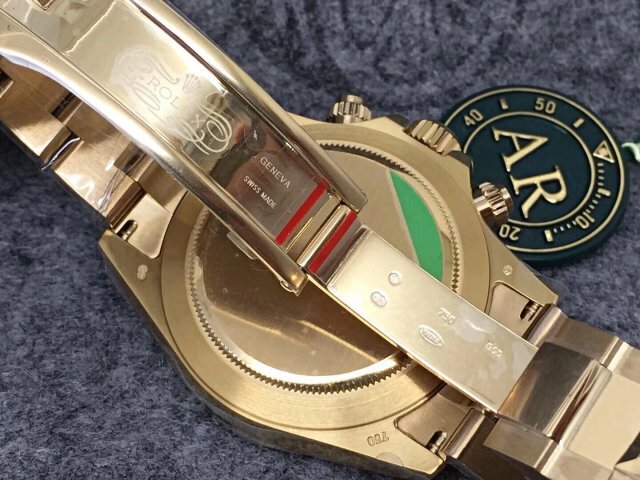 The replica will come with a plastic box like genuine watch. 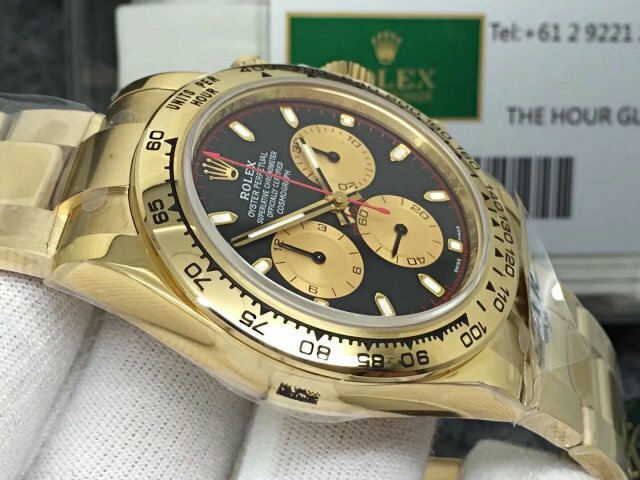 We do not offer original Rolex box for the watch, if you want one, you need to pay extra dollars.